The highest mountain passes in the world are in Tibet. You don't have to drive too far to find a 3000m, 4000m or even 5000m+ pass. Tibet is covered in the highest mountain ranges on the planet with roads going over them. 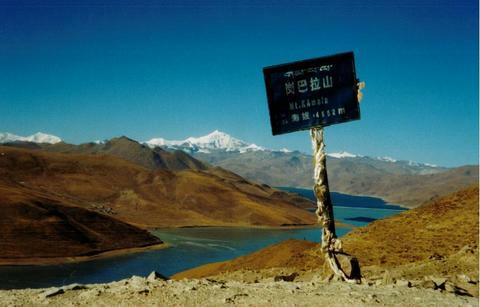 One of the highest passes in Tibet is the Tang Gu La (pictured above). 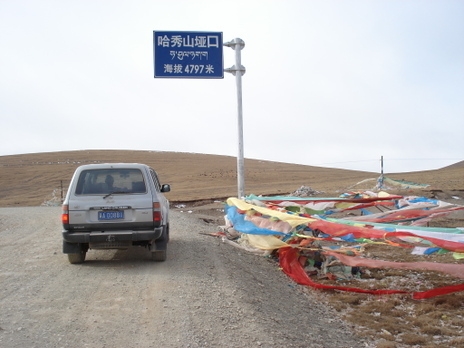 Heading south from Golmud to Lhasa on Highway 109 you cross this monster pass at 5231m / 17,158ft above sea level. The oxygen levels here are less than half of those found at sea level. 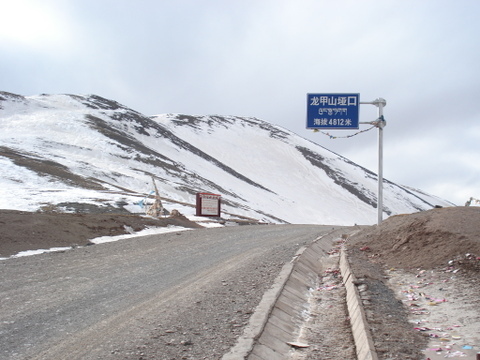 Most people experience at least some minor symptoms of altitude sickness when going over passes like the Tang Gu La. Minor symptoms include a headache, shortness of breath and nausea. Many Chinese and foreigners, who cross this pass on the bus, take an oxygen can or oxygen pillow with them to help relieve some of the symptoms. The new train now has oxygen available free of charge in all of the sleeping berths and seats making it much more pleasant going to Lhasa. 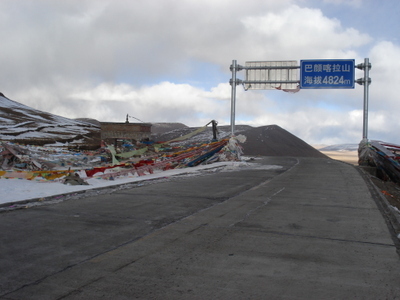 The Ba Yan Ka La mountain pass, pictured on the left, is one of the borders between Amdo province and Kham province. 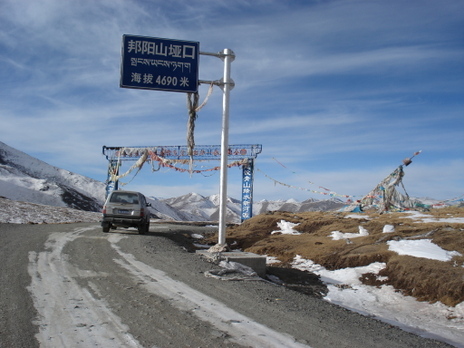 The Ba Yan Ka La is found on Highway 214 heading south from Xining to Jyekundo. The sign lists it at 4824m, but there are two other small signs off to the left (near the prayer flags) that give two other elevations which are over 5000m. My altimeter always lists this pass at around 4950m / 16,236ft so I am going to say that is the "official" elevation of the pass. The Kamba La pass has a great view of Yamdrok Lake and sits at an elevation of 4852m /15,915ft. It is located less than 2 hours southwest of Lhasa heading towards Gyantse. This is one of the most beautiful mountain passes in Tibet. The winding road drops 400m / 1312ft down to the lakeside. This pass is found just before entering Chumarleb, about 5 hours northwest of Jyekundo. At 4690m /15,384ft, the temperatures here in the winter are brutally cold. High winds blow here all year long. The town of Chumarleb sits not too much lower than this pass. The town sits at around 4300m / 14,104ft. It's crazy to think that the mountain passes are this high, but the mountain tops are so much higher! This pass is found on the road between Drido and Jyekundo way out in the middle of nowhere. 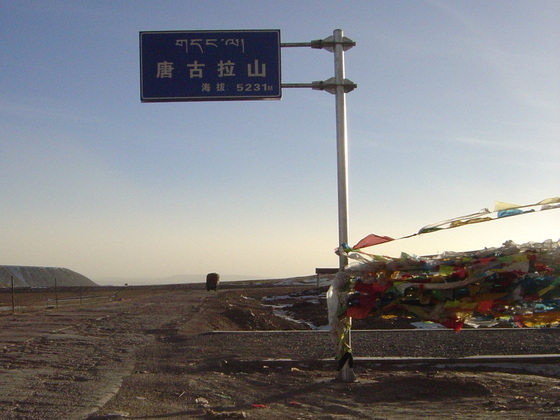 At 4797m / 15,735ft it is one of the highest passes in northern Tibet. The pass, like most others across Tibet, is covered in colorful prayer flags. This is another high pass found in southern Tibet. Being at 4812m / 15,783 feet takes the breathe right out of you. 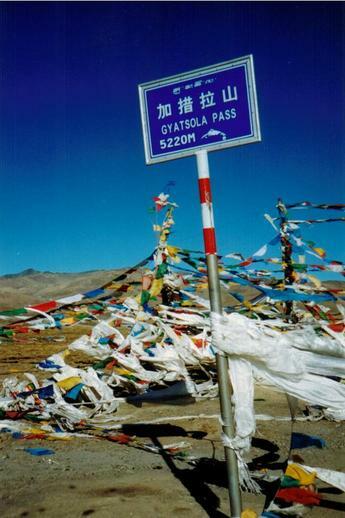 The Gyatsola pass stands at 5220m / 17,122 feet. You cross this when heading to the north face base camp of Mt. Everest. The wind at this eleavtion is always intense. Thank you for the comment. If you are ever in Tibet, please let me know. Beautiful photos! Your website is a wonderful one for me to tell my clients to look at. You have lots of good information and wonderful photos! Wow I'm going to have to add Tibet on my to-do list. Your pictures are inspiring!